A Move That Sends A Message. 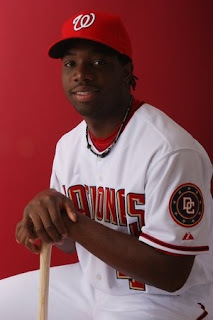 When Our Washington Nationals announced this afternoon that Lastings Milledge had been optioned to AAA Syracuse--the first reaction--"Yes, about time." Acting GM Mike Rizzo determining that Ocho-Cinco is not developing into a complete ballplayer. Lastings Milledge has tremendous athletic ability. What he is not is a tremendously skilled baseball player. In fact, his skills are lacking and need developing--something that doesn't outwardly seem to have worried or bothered Milledge in the time he's played for Washington. But how many times can anyone witness the same player take the same circuitous routes tracking fly balls? How many times can you watch the same player step to the plate and have a limited idea of what he should do once the pitch is thrown. How many times do you have to throw up your hands in disbelief saying: "What in the world is he doing out there?" And what makes these matters far worse is his attitude. By his own remarks, Lastings Milledge says everything will always work out. He's never at fault--not even for nearly skipping a mandatory team meeting on Sunday April 5th in South Florida. A "I am celebrating my birthday decision" that found Lastings fined, but not suspended. In real life--still responsible for their jobs, most everyone else works on their birthday. Yet, Milledge felt he could blow that Team Meeting Off only because it was "His Birthday". That's immaturity. Lastings Milledge was not ready for the responsibilities that Our Manager Manny Acta gave him when Manny named Lastings Leadoff Man. A cold hard lesson was hopefully learned today by Lastings Milledge when Our Washington Nationals sent him to Upper State New York for seasoning. He's still only 24 Years Old, many other talented players have suffered the same consequences and rebounded--improved and played out successful Major League Careers. But what's really important here is if Milledge UNDERSTANDS THE REASON WHY? Radio Broadcasters Charlie Slowes and Dave Jageler haven't been criticizing his play over the first week of the season for nothing. Tom Boswell didn't write his blistering column today about Lastings shortcomings after just watching him for one game. And most every internet board, fan forum and Nationals Blog hasn't debated the Pros & Cons of Milledge's play just because they have nothing else to gab about. The signal today sent by Our Washington Nationals is that enough is enough. You need to play The Great Game the right way, not just your way. Individuality is welcome, but not when you are underperforming and you see nothing wrong in your duties. Lastings Milledge needs to make some serious adjustments. His optioning to AAA Syracuse is a solid move because this sets an example: No longer can you get by on perceived talent alone. Performance, Attitude & Responsibility Count. PS--What this move also does is free up the logjam in the outfield for Our Washington Nationals. And immediately improves Washington's defensive capabilities in the field. With Elijah Dukes now GIVEN the centerfield starting position--you can bet that his skill set will assist the shortcomings of Adam Dunn stationed in left. Our Number 34's role will change. Every single baseball he can get to shadowing over toward Dunn--he will take. Austin Kearns will now be starting in right. This addition by subtraction makes for a far better outfield alignment. This move also gets stronger hitters in our batting order. If Adam moves to first, Josh Willingham now has a more important role in Washington's Lineup. No longer the 5th outfielder, Willingham's powerful bat will get more opportunities to prove why he was originally traded for in the first place. Josh has been wasting on the bench most of these first seven games. No corresponding roster move as this post is written. With Willie Harris already on the DL, Cristian Guzman possibly heading there and Ronnie Belliard still recovering from a back issue--Washington needs some middle infield depth. Whether that is Alex Cintron, Pete Orr or someone else--Acting GM Mike Rizzo will need to make that decision and have a new player in place by 7:05PM Wednesday Night. If "The Guz" heads to the DL, possibly there would be the opportunity for a 5th outfielder--someone like Ryan Langerhans, Justin Maxwell or Corey Patterson to play that strictly backup role/pinch hitter. Maxwell the only player mentioned whose recall would not affect The 40-Man Roster. At the same time, another decision will have to be made on carrying three catchers. Wil Nieves or Josh Bard need to be moved for Jordan Zimmermann on April 19th. Wil Nieves must have the upper hand. He's a far better catcher. Besides, Bard wears Cursed Number 7. The Jersey Number that has befallen so many Nationals Players before him. Austin Kearns will now be starting in right. Has this been announced, or is there a possibility it might be Willingham - at least for a large percentage of the time? Because if they can't find room for Willingham, they really haven't solved the outfield logjam. Willingham needs playing time, and it can't be by moving Dunn to first to spell Johnson. Dunn doesn't belong at first, because Johnson and Zimmerman have been the only steady features of infield defense so far. Agreed...this move was more than appropriate. I think Milledge's sense of entitlement was aided by the lack of time he's spent learning his craft in the minors. I'd even send him to AA if necessary. I had to laugh out of frustration when the Opening Day crowd sent huge ovations Lastings' way after making catches against the outfield wall that seemed very dramatic. Boy...tracking those balls, the drama was the problem. He should have been standing there waiting for those balls to settle into his glove. Nicely done, Mike. Now, I'd like to see Willingham do a bit at first base so he could provide a bit more flexibility. Adam, my man...he's scary over there. Not that Dunn in left field is any prize. But I think Willingham would get more playing time and provide more options if able to contribute at first. Just an opinion. ABM--Rizzo on WTOP in a soundbyte early this evening said Dukes in center, Kearns in right. Willingham now given more opportunity to get at-bats but Manny will manage that aspect of the lineup. Defintely Bard over Nieves. Bard apparently has a reputation as being a defensive catcher, but I have not seen that at all. Nieves has a positive attitude, is respected by entire clubhouse, is good with the fans and plays his heart out every single day. It is his job to lose and I do not believe that he has lost his job to Bard. His spring training BA and OBP were higher than Bard's as well. Nieves did a great job catching for Lannan last year and should be Zimmermann's catcher. Count me among those who cheer this move, and who also cheered Lastings' catches yesterday ... not because they were the effienct plays (obviously, they weren't), but instead because I was absolutely shocked that he caught *anything* and needed an outlet for my emotions. Now that Guzman is hurt, let's move Hernandez to short and put in that exciting young ballplayer Bonifacio at second...umm..uh...darn, he's tearing it up for the MARLINS!! This team is a disaster. Sorry, there needs to whole lot more done with this squad than simply moving Milledge. There are a lot of problems -- on the field, off it, and from top to bottom. The season is only a week old and everyone is already wanting to throw a 24-year-old with potential off the ship? The season is only a week old and everyone is already wanting to throw a 24-year-old with potential off the ship?When "potential" turns what should have been a fly ball out into an inside-the-park home run, I'd be willing to take someone a little less talented who is less of a liability in the outfield. I know Adam Dunn isn't the second coming of Willie Mays, but he is doing his job at the plate, so I'm cutting him some slack. Milledge needs to learn how to field and how to be more patient at the plate, because everyone else's patience is coming to an end. The Nationals have finally sent a message to the fans and the players that they are serious about the product on the field. The thing that still is bothersome to me is getting Acta on the same page as the front office. Congratulations to the Nationals, this move alone should be felt in the attendance numbers. The thing that still is bothersome to me is getting Acta on the same page as the front office.What makes you think Acta is not on the same page as the front office? He clearly is consulted with and has input on all player moves, which is the correct role for a manager. I'm with phiten on this one. I appluaded the move, but I also saw this as a way for the front office to circumvent Acta's decision. Chico on the NJ was mentioning how, after Milledge skipped the team meeting, the front office wanted him benched for the opening day, but Manny wouldn't allow it, so the front office had no choice but to fine him instead. One thing peolpe may not realize is that it wasn't Manny's decision to fine Milledge; he doesn't have that authority. I may be drawing at straws here, but I saw this as a message to Manny as well. Put Willingham in right and sit Kearns. And to think the Mets once turned down trading Milledge to the Red Sox for Manny Ramirez straight up a few years ago when Manny was in one of his snits! Lastings should look no further than his former teammate Wily Mo Pena to see that potential will only get you so far in this game. At some point you need to put up or shut up. Has Kearns shown anything to make him the starter in right when you have Willingham, Bernandina and JMaxwell in the wings? I would like to see them using Willingham against lefties either in LF (days off for Dunn) or 1st which should get him a couple starts a week and then a couple more playing him in right in place of Kearns. Bernandina can give Dukes an occassional day off. It still has me nervous watching Nick playing every game. I agree with ABM on defense but Nick shouldn't play every day just to keep him fresh and healthy. The player I see to put in there is Willingham. For some reason they don't seem to think of Willingham as a first baseman. Manny shot that option down in an interview shortly before the season. With Milledge gone now, though, maybe things have changed. Manny and Milledge both ex-Mets organization guys - both on the way out: easier to put Milledge down on the farm; but my sense is the Rizzo is winning the job with Kasten's blessing, and that Riggleman is going to be named manager should Nats be effectively 0 for April. I am all for it. He is terrible. Trust in Gil Hodges. Acta wears No. 14 but not all good. Acta will not be fired unless and until Rizzo loses the 'acting' label. No one of consequence will take the manager job if the man who hires him doesn't have job security, because otherwise he'll be gone as soon as the real GM is hired. What is to be gained by firing Acta and replacing him with Riggleman, other than to make Riggleman every bit as much of a short-timer? To maintain morale, to gain focus, this team needs stability in either the GM or manager slot - especially when it can't have both because one of those positions is still only 'acting'. An acting GM and a manager who is thereby only 'acting' would spell no progress at all for the team. At least with Acta as manager they have stability through the rest of this season. I agree with those that this move, which was a no-brainer, further brings Manny down a peg. Rizzo is an interim GM, but I believe he has the job all but locked up. The term "acting" is not even used in media outside the Beltway. So Manny is gone unless he learns how to get relievers ready and make the right moves with his bullpen. But probably not until the end of the year. It's a broken relationship, but the spouses are still living together under the same roof, and for convenience sake will probably continue to do so. In the meantime, the players have a leadership vacuum. I can't get over how bad an outfielder Adam Dunn is. Recall what Jerry said about Elaine's dancing: "All right, you're beyond stink." I dunno. If I'm a real big league manager, and I'm approached to take a job by a GM, my first question is going to be "How long are you under contract for?" If the answer is "I don't know", I don't think I'm going to take that managing job. If I'm a bench coach on a team with an 'acting' GM and they fire the manager and ask me to take the job, sure I'm going to take it because it's a step up. But I'm going to know that my fortunes are tied to the guy with the 'acting' in front of his name. If he goes, I go, and it's back to being a bench coach unless I impressed enough for some other team to want me as a manager. Really, this team has far more important managerial challenges than management of relievers vs left handed power hitters. They're not going to fire Manny Acta on account of that. Get real. He is totally on board with their player development plan, as enumerated from Kasten on down. They didn't fire him over 59-102, and as long as he's somewhere above that (say 70+ wins) this year, they'll pick up his option for 2010. Losing seven in a row to start the season doesn't hurt him at all.